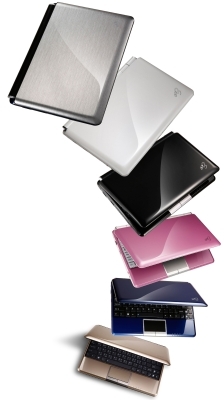 The Eee PC™ 1000HE has once again established itself as the consumers’ ultra-mobile Internet device of choice. Its incredible battery endurance and attractive overall value proposition have led the online community of LAPTOP Magazine to vote it as the winner of the publication’s ‘Netbook Madness’ face-off. This victory cements the Eee PC™ 1000HE as the best ultra-mobile Internet device in the world today. The Eee PC™ 1000HE was one of three ASUS ultra-mobile Internet devices that made it through to the final four. The Eee PC™ S101 and ASUS N10J-A2 also fared well in the tournament, finishing impressively as semifinalists. Extended Battery Life for All-day Mobile Enjoyment The Eee PC™ 1000HE has a battery life of 9.5 hours*, thanks to three main factors: ASUS’ exclusive Super Hybrid Engine (SHE), an Intel® Atom™ processor, and an LED-backlit display. SHE allows users to make power consumption adjustments to suit their tasks at hand, resulting in a reduction of power expenditure by up to 15%*. The Intel® Atom™ processor powering the Eee PC™ 1000HE is highly energy efficient, conserving battery power while still providing more-than-ample processing capabilities on-the-go. Finally, the Eee PC™ 1000HE’s 10-inch LED-backlit WSVGA display utilizes less power than conventional LCD screens, yet is capable of delivering amazing clarity, brightness and comfort for photograph and movie viewing, as well as Internet browsing. Corresponding High Praise from International Media The Eee PC™ 1000HE’s success in the ‘Netbook Madness’ tournament bears testament to its popularity among consumers. Its rapidly-growing reputation has also been bolstered by high praise from the world’s media. A PC Magazine reviewer wrote: “The ASUS Eee PC™ 1000HE is the best netbook package that money can buy right now”. “[The Eee PC™ 1000HE is a] smart netbook that not only gets the design right -- and it's priced to move”. Reviews from other media have also been highly positive, with NotebookReview.com saying that the Eee PC™ 1000HE is “the greatest out of any netbook we have reviewed”. Computer Shopper added: “The best Eee PC yet, Asus[sic] has tweaked the 1000HE to near-perfection”.